As well as oodles of birthday wishes from bands, podcasting friends and listeners, I received a lovely surprise from Santa Dog – my own set of badges ! 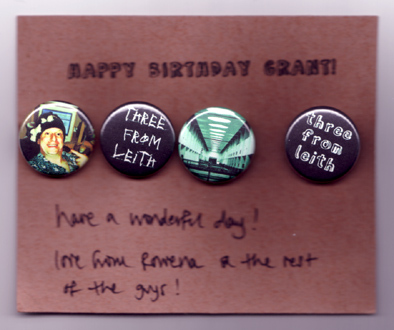 Rowena and the gang are absolute stars – they’ll go brilliantly on my new bag. Thanks to all for their good wishes – I’ve had a brilliant day. Show 32 – Younger than I am ! Age is a terrible thing. It really affects your memory – I mean, it really does seem like only yesterday when I was celebrating my 30th, or 21st or 18th… I don’t look any older (apart from he odd grey fleck appearing in my still-thick hair), I still have the sense of humour of a 12yr-old schoolboy and I have a new girlfriend who’s not yet 30. Oh yes – and my boyish charm, wit and good looks. I guess it’s all (mostly) in the mind, but then again there’s that load of extra weight that’s crept in which no longer goes away by eating less, so there’s a physical element to it too I suppose. Roll on the arrival of my first bike since I was a teenager, and getting myself back into peak condition ! In the meantime, I’m going to kick back and do a little advanced celebrating with an almost solid half-hour of great music. Enjoy this little birthday treat as I keep my mouth shut for a week and let the music talk for me ! All-round top bloke and one of the UK’s greatest underappreciated singer/songwriter/poets John Watts kicks off the party. TFL’s no.1 Canadian friend and another all-round good guy Freddy Litwiniuk with the song that made my buy one of the first albums I got from an independent artist featured on a podcast (The Bob & AJ Show). A soaring chorus that lifted me right out of my seat on the bus. Magical. Why is Phideaux not a huge, million-selling artist ? There’s really no justice in this world. Consistently excellent and prolifically talented, here’s a track with one of those melodies and chord-progressions that stir the emotions and send shivers of pride down the spine. A lovely, jangly track from another fabulous Edinburgh band. Sadly I missed their recent gig but there’s always the next time. This is a rough mix, but still sounds better than many band’s final mixes. This band had slipped right underneath my radar but a recent tartanpodcast brought them to my attention almost at the same time as the band contacted me. Cracking angular rock from these Glasgow boys who’re tipped for the top. After going down a storm on a recent TFL, it’s the return of top quirky-popsters The Hussys. They’re braw !! More hooks than a fisherman’s tackle-bag and more catchy too. They’re going to be thiiiiiiisss big (throws arms wide) !! Buy them NOW !! Take a dollop of Bruce Springsteen’s vocal cords, stir in a smidgeon of Van Morrison, season lightly with Tom Waits and cover in a layer of haggis before baking in a hot smokey oven. After an hour, reove and serve up TFL newbies The Overside. An addictive album. A haunting closing track from the enigmatic Blueneck from Bristol. All that Blueneck’s dunk will reveal is that ‘oig’ is an acronym. If you think you know what it’s an acronym for, drop me a line ! If you get it right then Blueneck will reward you for your perceptiveness with a CD and a T-Shirt ! This week’s soundbed is ‘Nae Tongues’ courtesy of Isa & The Filthy Tongues on Circular Records. Catherine at Fretless Records for the fantastic Overside CD which you’ll hear more of very soon ! 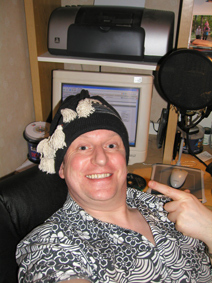 Subscribe by RSS Feed to the free www.podcastusermagazine.com – Issue 3 out soon ! This week’s show was one of those where I started off planning a mellow show, but as I listened to the ‘to be played’ folder on my iRiver my mood began to shift. So the mellow led into the more upbeat (thanks to Row from Santa Dog for telling me about her new favourite band Papermoon), and then I was in such an upbeat and urgent mood when I came to record the show that nothing else would do except the final act on tonight’s bill of fare. Played back, they did make an amazing progression from one end of the mood spectrum (moodrum ?!) to the other and so another Three From Leith hits the feeds with top quality acts. If you enjoy it, please drop me a note and let me know; each show takes up a large chunk of my free time every week and it’s good to know that it’s been time well spent and enjoyed by you, my friends out there in the podosphere. From the stunningly talented Chris’s fabulous ‘Ill Advised’ album which I urge you to buy immediately. Thanks to Row from Santa Dog for the heads-up, and Blair Purda from the band’s record label, Endearing Records (label MySpace) for sending me the tracks within minutes of contacting him. Please visit them if you can. Currently going down an absolute storm on Scottish podcasts, the Glasgow-based trio are selling out their CDs fast, so check here to see if you can still get one before it’s too late. With talent like this, you’d better get your skates on ! This week’s soundbed is ‘Raining Colours’ courtesy of torchomatic. Show 30 – Extraordinary Rendition ! Anyhoo – for your aural titillation I bring you three independent Scottish bands this week who are all brand new to Three From Leith. Please enjoy, and don’t forget to email them / me / your friends / the press / Dubya to tell them how great you found them ! Opening track from the Fifers’ excellent upcoming “Runts Of Darwin” EP, due out on 17 April 2006. Find it here when it’s released, or content yourself with their debut album until then ! Incredibly catchy first track on their demo CD, which I’m sure you can email them and persuade them to sell you ! Whack My Bush – the podcast that takes the p*ss. Sarah at Circular Records for the fantastic CD selection which you’ll hear more of very soon ! Show 29 – I say Phideaux, you say Fido ! Oh dear… for quite some time I’ve been playing music by Phideaux Xavier and referring to him as “fee-dough have-ee-ay” when in fact he’s “f-eye-dough ecks-ay-vee-yer”. See ? – too many years studying French at school have left their mark and forced me into imposing imagined pronunciations on foreign-looking names. Still, he took it in good humour and we’re still on speaking terms ! On this week’s show you’ll hear the opening track from the ‘lost’ Phideaux album – which is probably the only place you’ll ever hear it. Hold the presses – there’s an exlusive on this week’s Three From Leith ! Oh yes – please continue to encourage my weekly endeavours by leaving comments, sending emails or sending audio comments so that I know you’re out there, even if you are hiding behind the sofa in terror…! From the shelved ‘313’ album – another stunning and beautiful track from a man who’s talent never fails to leave me speechless. Buy his other works here on CDBaby – go on, treat yourself! Another cracker of a track from the Edinburgh songsmith’s ‘One Way Ticket’ album. Buy it now! ‘Stutter is fast cars, roller rinks and dirty magazines..’ says their site. Great 80’s-sounding synth and guitar new-wave electro-popsters with feisty ladies and gents with a penchant for red, black and white. This week’s soundbed is ‘Space Stuff’ courtesy of Pierre Journel on the PMN. A small selection of pics from the Amplifio gig at Cabaret Voltaire on the 18th Feb 2006 can be found here. PodcastUser Magazine – Issue 2 out now ! 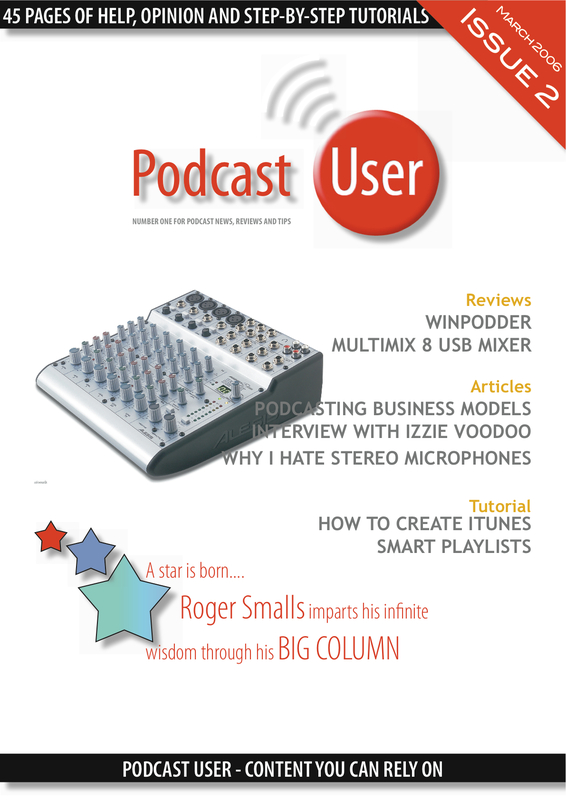 Go over and download or subscribe to the latest bumper issue of PodcastUser Magazine. All for a Scotman’s favourite price – FREE !! Entries (RSS) and Comments (RSS). 25 queries. 0.668 seconds.